When multi-talented American singer Pharrell Williams released his single Happy in 2013, it immediately shot into popularity. An instant commercial success that was vibrant, bouncy (and, well, happy) the song took on a life of its own when it was used in the Despicable Me 2 soundtrack, and was played all over the world on the radio. The song became even more famous for its ’world-first 24-hour music video’ where the single was played on repeat multiple times and people were filmed dancing and miming the lyrics over a period of 24 hours. 24hoursofhappy.com, the website this video could be found on, spawned thousands of YouTube cover videos, and started a global phenomenon. 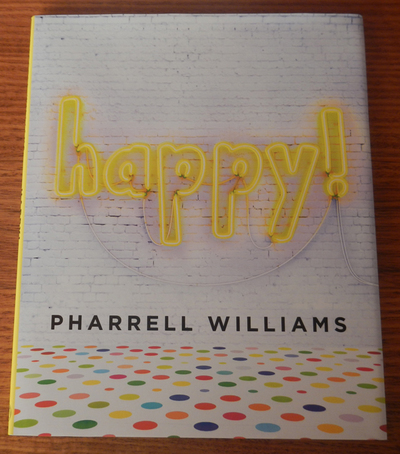 With the success of the song and its empowering message of happiness, Pharrell Williams has now released Happy! – a picture book rendition of his positive tune. Featuring the lyrics of the song as the text of the book, each page is filled with photos of children from all backgrounds having fun and being happy. Many of the pages show the children dancing and using their imaginations as they embrace the empowering lyrics that proclaim that when you’re happy nothing can bring you down, and that when there’s bad news you’ve got to rise above it and find the silver lining. This book is bright, colourful, cheerful and fun, and as you read through it, you won’t be able to help humming along the tune of this incredibly infectious song. While the book doesn’t come with an audio CD (which probably would have been a good idea), it does come with a positive message at the back (penned by the author), encouraging a positive outlook for the life ahead of you, and reminding people that happiness (or even a simple smile) can change the world for the better.